Once upon a time there was a girl who dreamed of bongos in basements. She’d seen a tv show about beatniks. They were strange people with sunglasses and berets and they beat on drums and they spoke weird sentences. The girls looked sharp in tight pants and long hair. They wore interesting jewelry. The girl who was the dreamer thought “how different these people were from the people on American Bandstand!” The ABS people had great clothes – especially the girls. But they all looked so frozen. They seemed very unhappy. 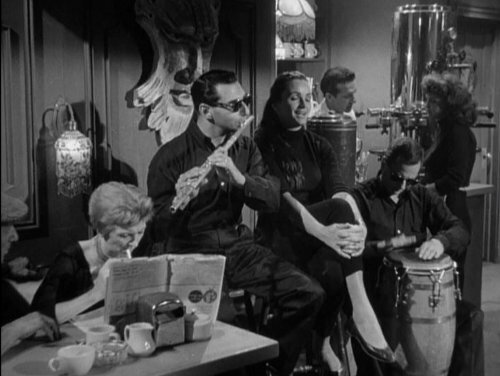 The people called the beatniks seemed – something – maybe not happy in a Leave it to Beaver kind of way. But not unhappy in a desperate Ben Casey sort of way. They seemed intent on something – on their music, on their speaking poem things that they were doing. They seemed intent on each other. There was this energy. And it made the dark basement they were in seem light. In the girl’s dream, she was friends with the men who were smoking and the girls in their tight pants. She sat in the audience when they got up to sing their songs or say their pieces. She was a part of their gang. She went to a dance in a church basement a few years later. A boy she knew was in a rock band and he played the flute. He was better than the Jethro Tull guy. He could really play. She had that same feeling about basements. She wished she had a talent she could share. Years went by. There was no money. So the girl became a teacher. And then finally, there was health insurance and enough money to live on and a place to live in and a man to live with in it and a child who lived in it too and who then grew up and moved away. The girl who was by now a woman and an older woman at that heard about this basement near her house. 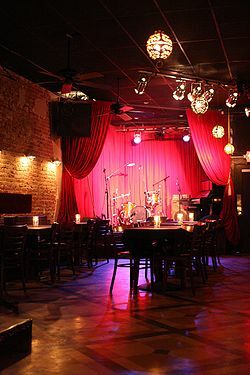 It was a famous basement where rock musicians played and where important artistic people got their start. She went with a friend and sat in the dark and heard people say their pieces. Heard a young man play guitar and talk about his family. She looked at the light bulbs, glimmering in their shades on the sidelines of the room. She thought about the book she wrote with poems in it. She thought about the book she wrote with a big story in it. A man she knew well got up and read a scary funny story about a hit man killing a doctor. A beautiful girl came up and read a scary funny story about axe murderers. Another man told about how big cities can hurt you but that teaching who you are can help everybody. The girl watched the people from her table. The friend that she brought was an artist. Siting on the other side of her was a famous poet wearing jeans and interesting jewelry. All that was missing were the bongos.